Great Wolf Lodge Southern California dazzles families with its indoor/outdoor waterpark, arcade, proximity to Disneyland, Magiquest electronic scavenger hunt, on-site bowling lanes, spa especially for kids and much more. Add holiday magic to the mix, and this hotel in Orange County becomes enchanting indeed. 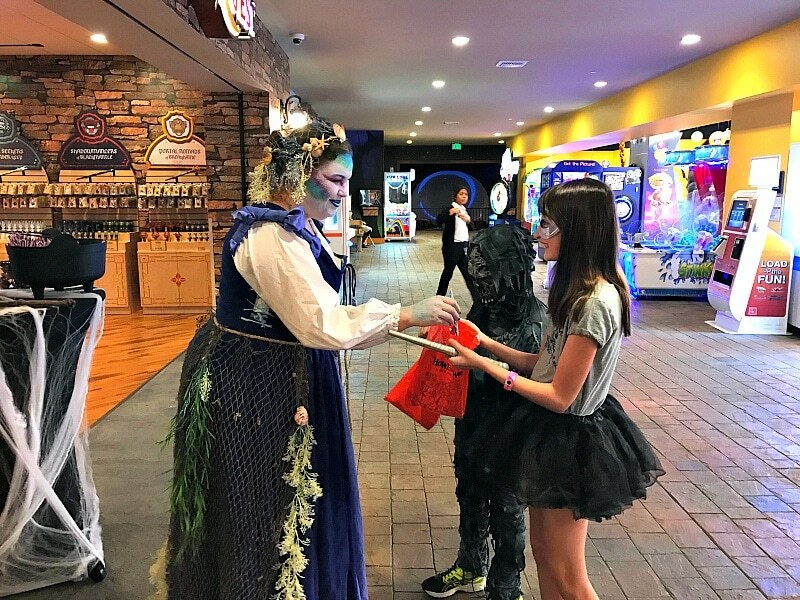 From Snowland during the winter holidays to Spring-A-Palooza in March and April, and Howl-O-Ween in the fall, Great Wolf Lodge Southern California’s holiday activities wow guests year-round. From Thanksgiving weekend through January, Great Wolf Lodge Southern California hosts Snowland. This holiday bonanza is replete with fun activities and eye-popping decorations. Indoor snow that melts into the warm indoor waterpark, anyone? 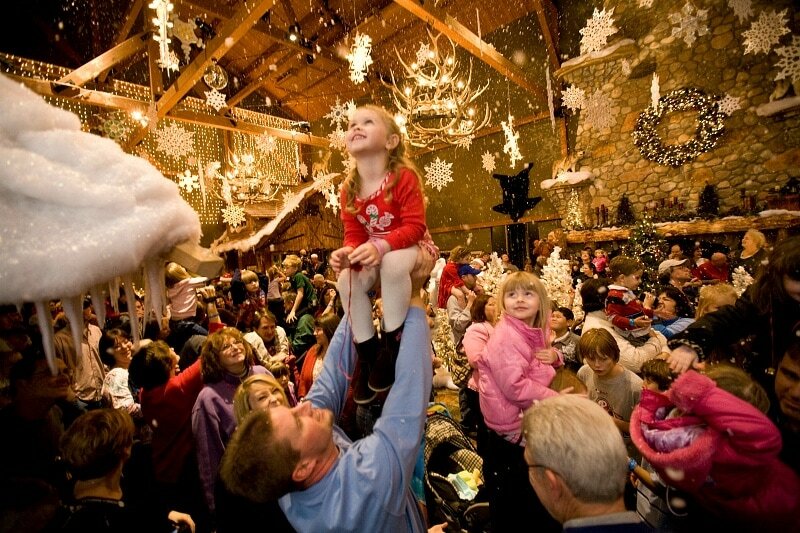 At this magical winter wonderland, expect an annual tree lighting ceremony and visits with Santa Claus. Guests can even dine inside a life-sized gingerbread house! (For a $10 donation to Ronald McDonald House Charities.) What’s more, children can enroll in North Pole University to complete holiday-themed activities and receive their official “Snowploma” plus a special-edition Rowdy the Reindeer trading card. 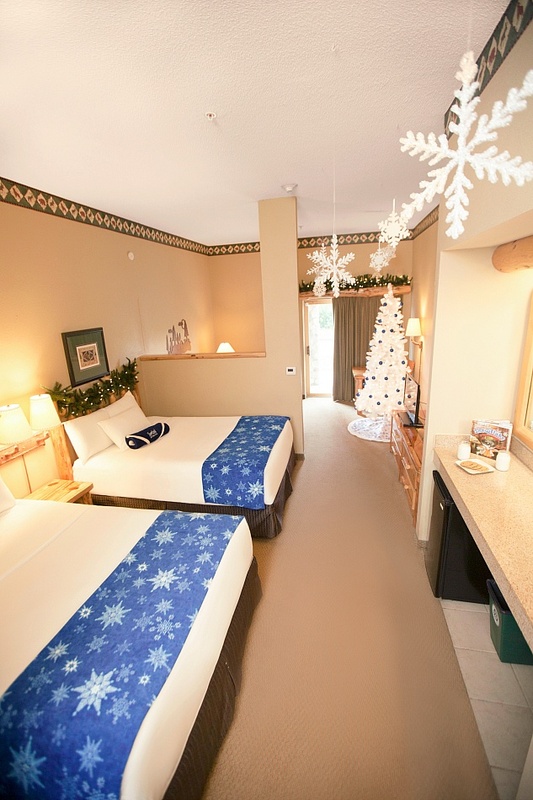 Make your Christmas or Hanukkah stay even more memorable by booking a Snowland Suites as an upgrade. These special suites come decked out with garlands, twinkling lights and a fully decorated holiday tree. Guests will receive a free copy of their winter story book, Unique as a Snowflake. As a special surprise, a Great Wolf Kids character will bring young guests an evening milk and cookies delivery. New Year’s Eve is traditionally a grown-up holiday, leaving parents struggling to come up with something special to do together as a family on the year’s final night. Thankfully at Great Wolf Lodge Southern California hosts a kid-friendly celebration called Snowball. This party features an impressive buffet and celebration in the hotel’s Conference Center. There’s also music, a ball drop and more to help families ring in the New Year. Welcome warmer weather and budding flowers with Spring-a-Palooza at Great Wolf Lodge Southern California from mid-March to mid-April. 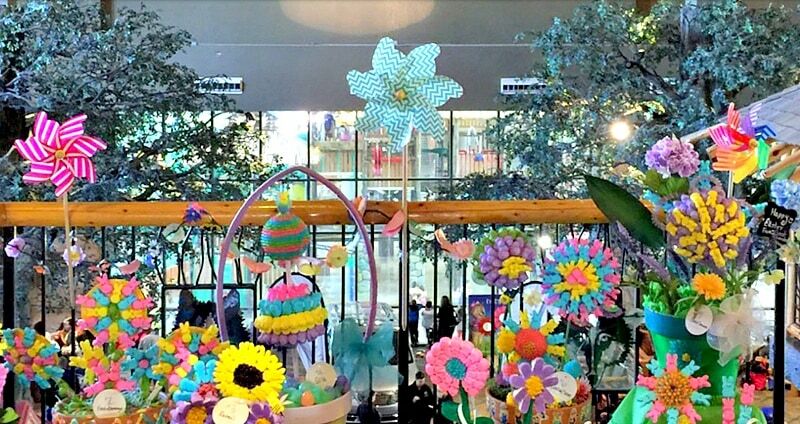 This spring celebration includes colorful decorations and hand-made gardens in full bloom around the Grand Lobby. Families can take part in crafts, scavenger hunts, Grand Lobby picnics and more. Kids especially love seeking the Easter Peeps hidden throughout the property. 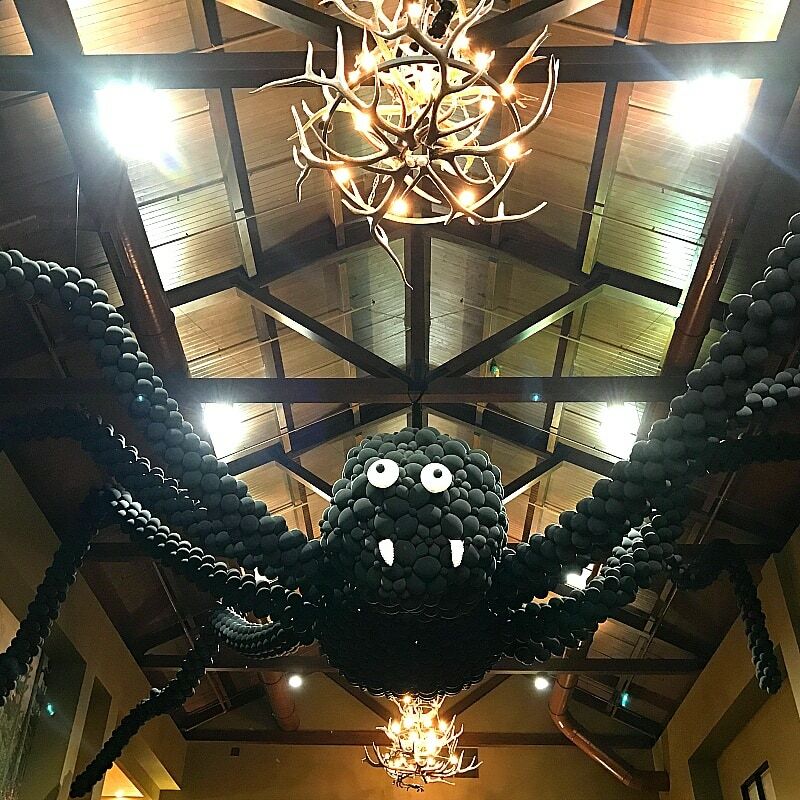 A giant smiling spider made of balloons welcomes guest to the Grand Lobby during Howl-O-Ween at Great Wolf Lodge Southern California. Kids and adults alike dress up for trick-or-treating along an indoor trail to collect treats. Children love showing off their ensembles in nightly costume parades for a chance to win a cool prize. Didn’t pack your costume? No worries! Guests all receive a set of Halloween-themed wolf ears at check-in. Round off each evening with Spooktacular Story Time with the Great Wolf Kids characters in the lobby. As though that weren’t enough, on weekends guests can enjoy Monster Bash Dance Parties where they can dance and play games. My family was lucky to get a chance to experience Halloween at Great Wolf Lodge Southern California in Garden Grove, California. The party was so hoppin’, we’re considering foregoing presents in favor of booking a stay at this hotel for Christmas or New Year’s Eve next year. Normally my kids would balk at the idea of giving up a pile of gifts. But when presented with the lure of Great Wolf Lodge Southern California over the holidays, they jumped up and down and said, “Yesssss!” Now that’s a hotel that understands how to make families happy. Read more about Great Wolf Lodge Southern California on TripAdvisor. You may also want to check out tips for visiting Great Wolf Lodge from our friends at Trekaroo. If you love Great Wolf Lodge’s indoor water park, then you’ll love this list of the best indoor hotel pools for kids! Have you ever stayed at a Great Wolf Lodge? Let us know in the comments below! A Note from The Travel Mama: My family and I were hosted by Great Wolf Lodge Southern California. All opinions are my own, as always. This story includes affiliate links. Your purchases and clicks help to keep TravelMamas.com a free resource for readers like you. That looks like so much fun! We love Great Wolf Lodge. We’ve never been to the California one though. It looks like the perfect place for our next trip. I’m the opposite…Great Wolf Lodge Southern California is the only GWL I’ve visited. I’m sure my family would love them all, though! Especially the outdoor poolside grill. Yum! That sounds like a wonderful getaway for any family. I love going somewhere that has everything for everyone. Myrah – Great Wolf Lodge Southern California certainly fits that bill! It looks like Great Wolf Lodge is the place to be all year round. They have so many festive things for every season. Right?! I want to go back to experience springtime and the winter holidays here! What a fun place to spend any holiday! You had me at indoor water park. LOL ~ our family is big on water parks, too! I would love to check out the Great Wolf Lodge in Southern California. It would be an amazing place to spend the Holidays with the kids. We love the Great Wolf Lodge. I’ve never been there during the holidays- love all the decorations! Oh, you must, Shell! You’d love it! I havent been to great Wolf Lodge in forever! I always love traveling on holidays because things are so festive! Kelly – Things are especially festive at Great Wolf Lodge Southern California during the holidays, too! How fun that they decorate for every holiday! I have never been to Great Wolf Lodge, but it’s definitely on my travel wish list! 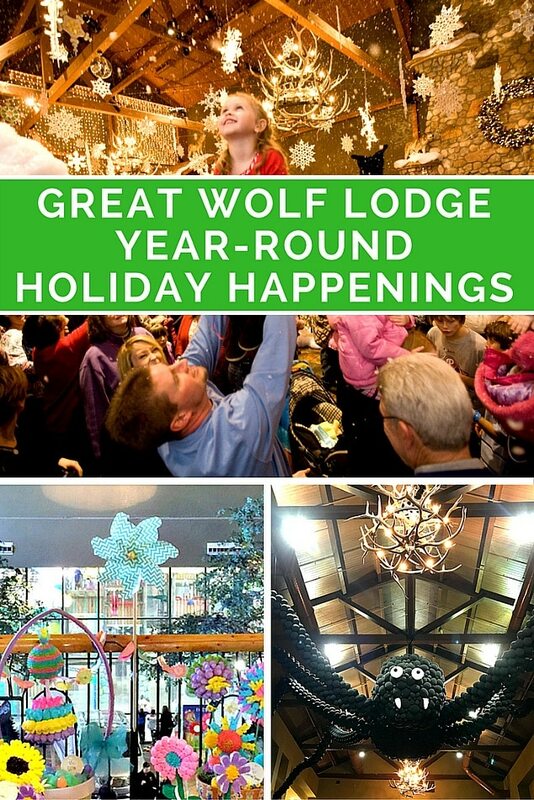 I hope you can visit Great Wolf Lodge Southern California soon…especially during the holidays! We have not stayed at one. None are close but I am going to see about staying one for a holiday… looks like a blast and a great place for a vacation. Oh fun! I hope you can go, Kristi! This looks like a great place to stay for the holidays! Wish we can visit this place soon! Oh this looks like such an amazing place to stop for a while <3 the bedrooms are just beautiful as well. I would love to go there over the holiday. It’s the full-sized holiday tree that really wows me! I hope you can go over the holidays someday! I haven’t stayed here nor at any place near Southern California but seeing this nice place just makes me want to come up with an excuse to stay there for a week. The rooms look cozy, the halls and entertainment areas all look awesome! And it’s so close to Disneyland, too! I hope you can book a stay here someday!